This page is for the original game. 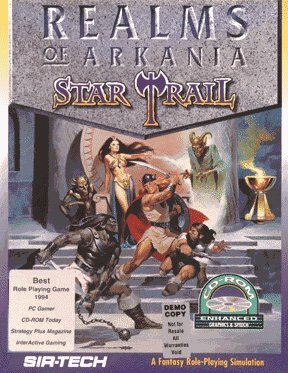 For the 2017 remake, see Realms of Arkania: Star Trail (2017). Characters can be imported from Realms of Arkania: Blade of Destiny (see Import characters). Includes Realms of Arkania: Blade of Destiny. Pre-packaged with DOSBox. The manual is needed to answer copy protection questions (see passwords.pdf for digital versions). The English version has MIDI music whereas the German version has CD music; it is possible to Use CD music in English version. Go to the Realms of Arkania: Blade of Destiny installation folder. Go to the Star Trail installation folder. Go into the GAMES folder and paste the Blade of Destiny files. Run the game and load the save you want. The party will be imported. Open the Go menu and choose Go to Folder. Right-click Current.boxerstate and choose Show Package Contents. Go back to the Gamebox States folder. Go into GAMES and paste the saves here. These steps change the German CD version to use English text. This requires the German CD version (GOG.com has both). The intro and some minor game text will still be in German. To have German speech with English subtitles copy only STAR.DAT from the English folder. NPCs will have 50x their normal XP value when you recruit them, as the English version uses has a multiplier for all XP gained or required. This can be fixed by hex-editing STAR.DAT, but must be done from a save from before the NPC is recruited to prevent excessive stat increases. Go to DATA in the English installation folder. Copy SPEECH.DAT, SPEECH.FN, SPEECHCD.DAT, SPEECHCD.FN and STAR.DAT. Go to DATA in the German installation folder. Paste the files here, replacing existing files when prompted. Use the German version of the game which will now be in English. Generated characters are stored in <path-to-game>\GAMES\CHARS1.DAT; this file is not needed for loading save games (characters are stored in each save). Diary and character sheet data is saved to file when Print to is set to File in Game Options (F3). To print from within the game see printer support. 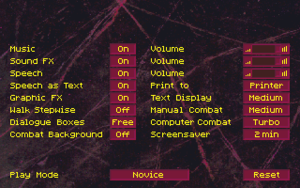 All speech is subtitled by default (Speech as Text in Game Options). GOG.com's Windows version is incorrectly configured. Change irq=7 to irq=5 and save your changes. Voices will now work correctly in-game. Set up DOSBox printer support. For the GOG.com version the file to edit is dosboxrealms2.conf in the installation folder. For the GOG.com version also copy the FONTS folder from the DOSBox folder into the Realms of Arkania 2 folder. Journal pages and character sheets can now be printed when Print to is set to Printer in Game Options (F3).